This Italian style house design gallery features a beautiful 5 bedroom and 8 bathroom estate sitting on 1.89 acre of land. Tuscan beauty and old world charm are combined with today’s craftsmanship to create a one of a kind estate home. The house boasts a 9200 square feet of living space with luxury finishes and elegance throughout. 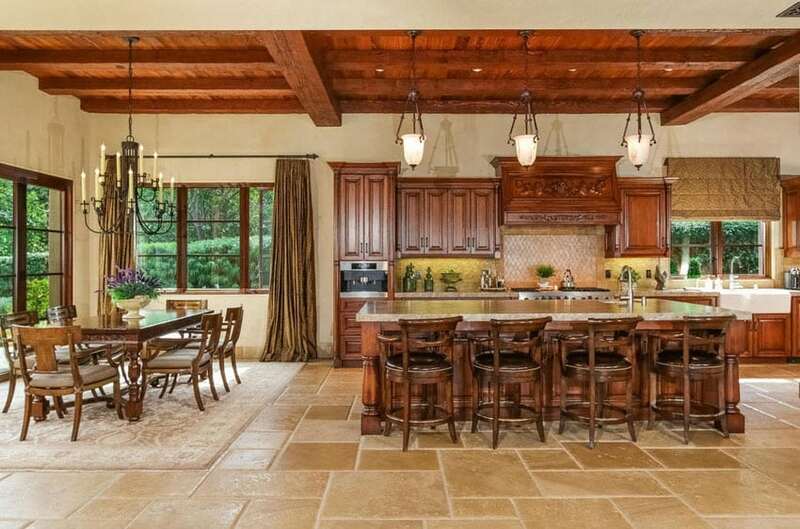 An open concept gourmet kitchen opens to a dining area. A luxuriously furnished living room offers breathtaking views of the northern coastal San Diego hills. In the picture the Tuscan style home presents the perfect regal entry with a wrought iron staircase leading to the grand entry. 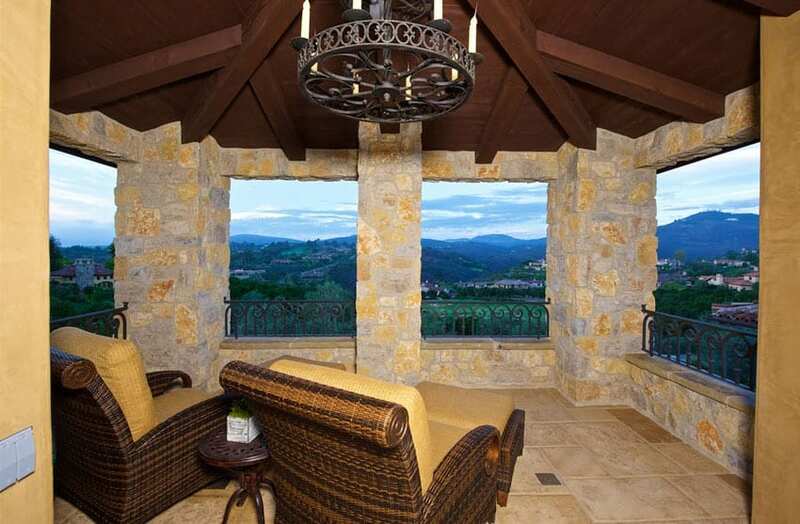 An upstairs open area covered patio provides a perfect spot for watching the sunset over the hills and enjoying everything the scenic views have to offer. Built to resemble Italian villas, an Italian style house design takes inspiration from 16th-century Renaissance architecture. Also known as the Italianate style, or Tuscan Villa style, it first appeared in the US in the 1840’s. It became popular as an alternative to Greek Revival and Gothic design styles which were popular at the time. An Italian style house is similar to the Mediterranean style and most often features low-pitched roofs, wide overhanging eaves, square cupolas, decorative stone work, wrought iron decor and a symmetrical design. This formal Italian style estate with its clay roofing, carefully planned landscaping, stone entryway and custom crafted elegance will delight you as you approach the entryway. The home provides old world elegance with its living room featuring a high wood beamed ceiling, intricate fireplace, custom wood work, and breathtaking balcony views. From this view one can see the detail of the stone walls with arched hallway, exposed beam ceiling and rustic chandelier. This elegantly furnished living space opens to the balcony with architectural elements that allow one to experience the best of indoor and outdoor living. 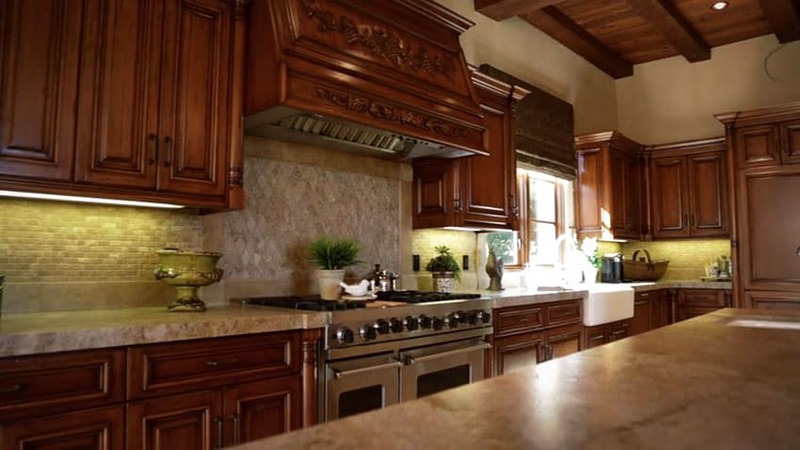 An open concept gourmet kitchen with rich wood cabinetry, an eat-in dining island, farmhouse sink and high-end stainless steel appliances are ideal for the chef of the house. The open layout flows to a dining room area with a gorgeous view through large rustic wood framed windows. 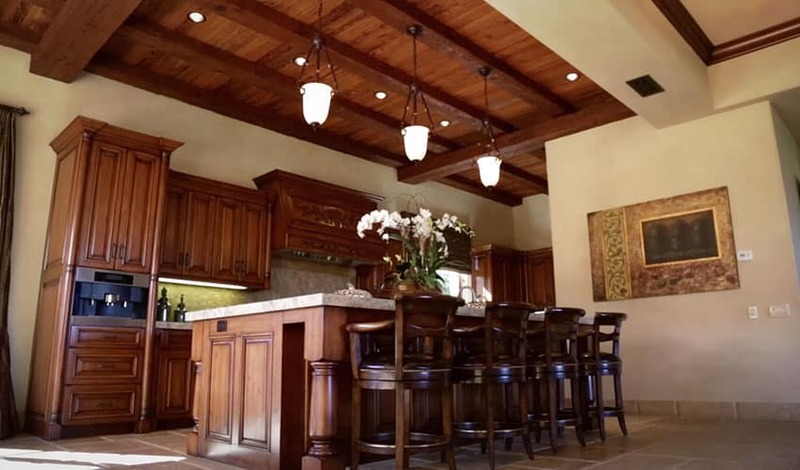 From this view of the kitchen you can see the detail of the custom cabinetry a long with the pendant lighting and wood planked ceiling with large beams. Looking across the kitchen island one can see the large six burner stove with its tile backsplash. Another small brick style backsplash lines the rest of the walls of the kitchen and compliments the light color of the natural stone countertops. 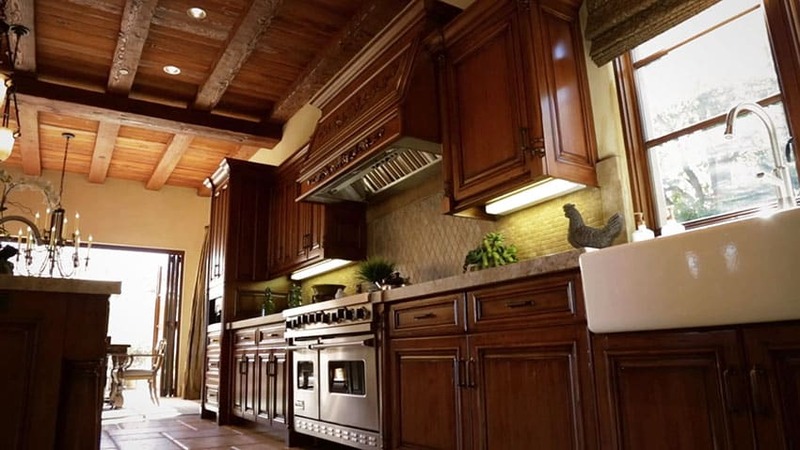 From this angle of the kitchen you can see the large farmhouse sink and the dining area that opens with large French doors on to the outdoor patio. An oversized chandelier continues the rustic style of the home. A formal dining room with stone walls, decorated fireplace, burnished chandelier, exposed wood beam ceiling and French doors that open to the balcony looks stunning. 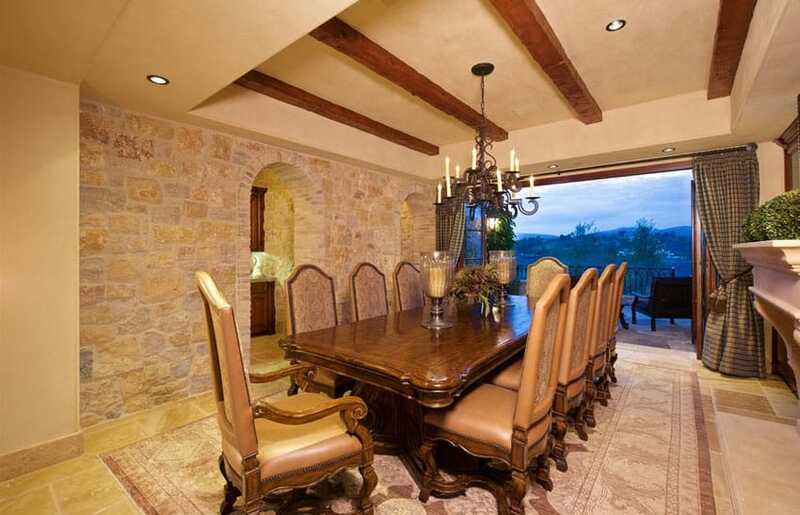 This elegant dining room is great place for entertaining friends and family alike. A romantic master bedroom with his and hers bathroom makes a grand impression. The bedroom features a decorative fireplace, luxury furnishings, wood flooring, and a tray ceiling containing recessed lighting. 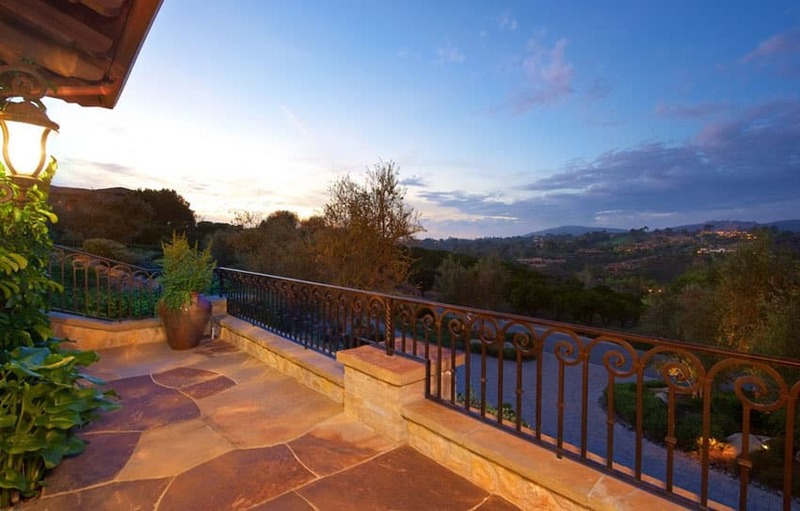 From the opposite direction one can see through the french doors to the panoramic views of the San Diego hillside. A large balcony patio is a favorite place to relax and enjoy this master suite. Another view of the master bedroom with its elegant furnishings and spectacular balcony views. The master bathroom offers a large oval soaking bathtub with a large frameless glass shower. A large vanity with dual sinks offers a good amount of space to prepare for the day while large windows let in plenty of natural light. This guest bedroom features the same hardwood flooring and luxurious wood furniture found throughout the rest of the home. A wood bed bench matches the two end tables and matches well with the home’s design aesthetic. A game room with a billiards table, TV, wine fridge and bar make a great room for fun and games. A comfortable couch provides space to sit and relax. 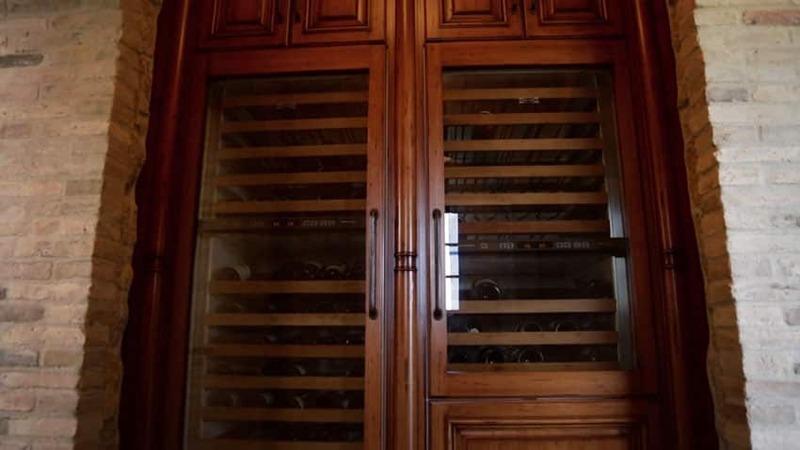 A large custom wood framed wine storage area with glass doors offers plenty of space to keep your favorite vintage in a cool environment. A spectacular covered outdoor patio presents beautiful panoramic views of the surrounding hillside, nearby orange grove and golf course. The rustic Tuscan style balcony with wrought iron railing affords amazing views of the estates grounds and landscaping. A stunning gourmet cooking Cabana features an outdoor fireplace and outdoor kitchen under a vaulted wood beamed ceiling. 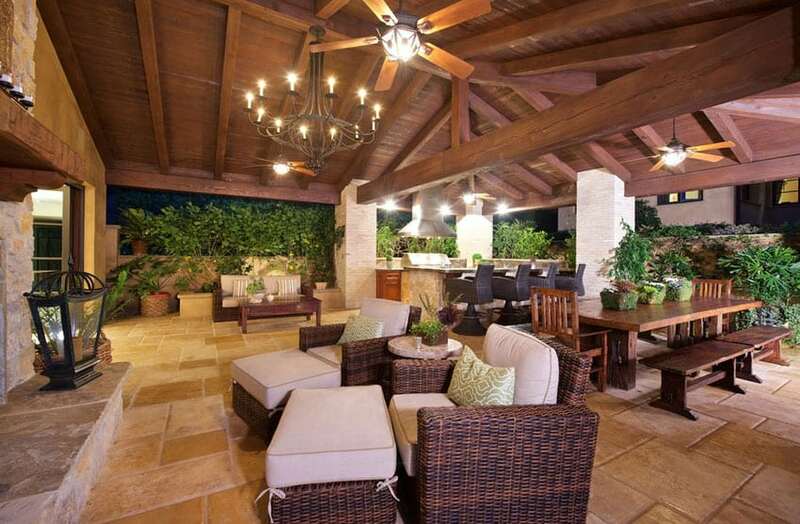 guests have plenty of room to enjoy the numerous amount of seating and space provided by this expansive covered outdoor patio area. Synthetic wicker seating is ideal for the outdoor environment and a large wood picnic table looks charming and can seat plenty of visitors. The large fireplace makes a fun gathering place at night. 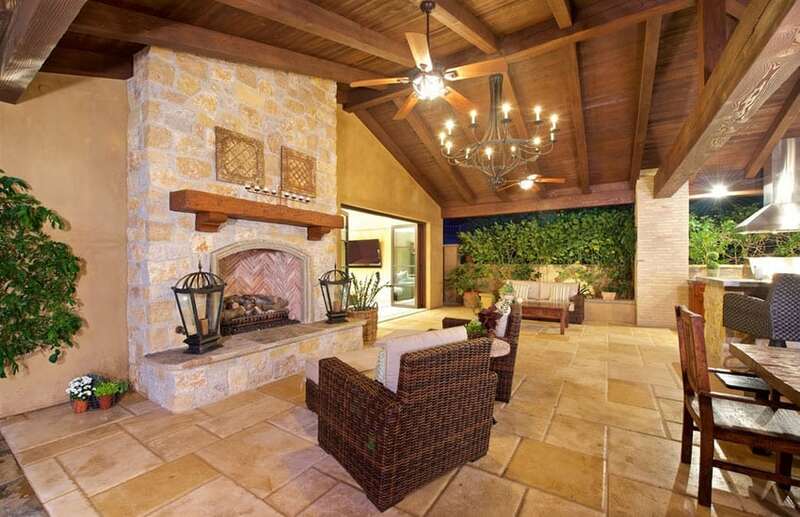 This space is ideal for those looking for true luxury outdoor living. 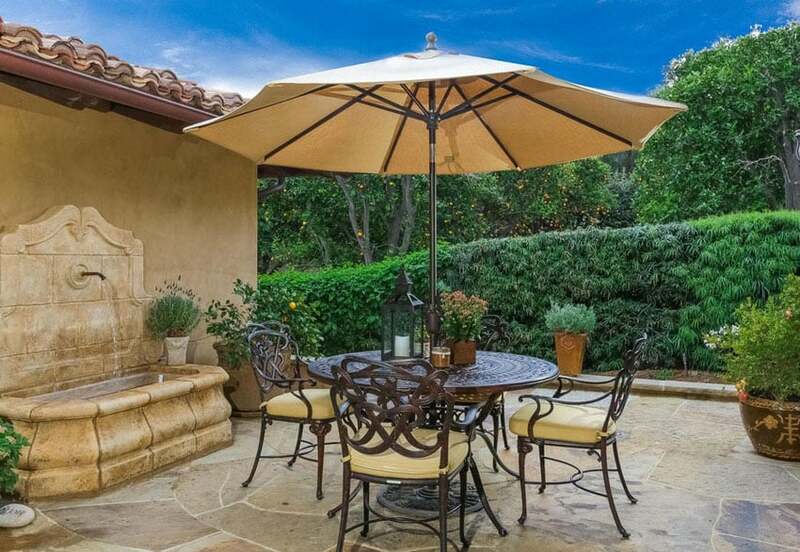 A gorgeous decorative fountain seems right at home at this Italian style home and this stone patio is a fine place to sit and enjoy the ambiance of the flowing water. An aerial view of the modern pool with it elevated hot tub. A fully self contained guest house sits to one side providing a complete resort style living experience. The stunning swimming pool sparkles in the twilight and beckons visitors for a refreshing swim. The warm Italian style house design will transport you to another place that reflects the embodiment of luxury and fine living. Whether you’re relaxing by the swimming pool, soaking in the hot tub or enjoying one of the many amenities found here this home will provide you the ultimate vacation from home. 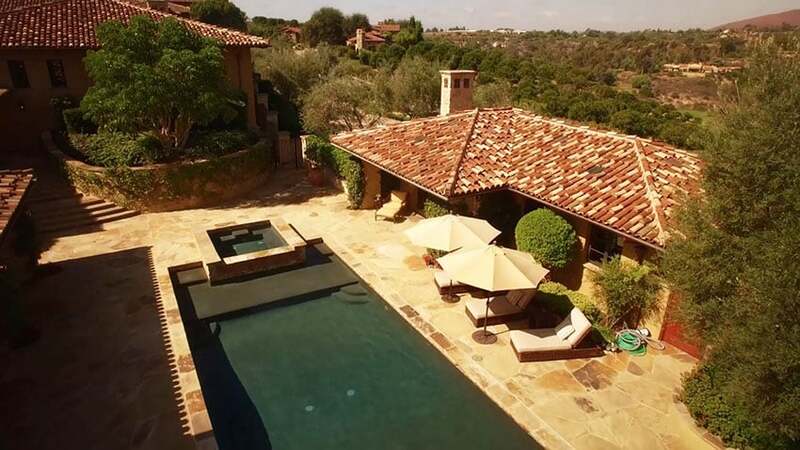 This beautiful Tuscan style home is the definition of luxury. It’s old world Venetian craftsmanship and architectural elements provide a true one of a kind experience. to learn more about this luxury home call Delorine Jackson at (858) 822-9694.